The snow piles on hoods of cars, front porch furniture, pots filled with dormant living things and the beginnings of crocuses. Writing tells me it’s worth it to remember these details and the way air smells different in the white, the way sounds echo like drums off tree trunks and the sides of houses. Writing makes paths through the drifts, sometimes in the shuffle of small boots, sometimes tromping heavy-footed, mastering the mound. Writing is bundling up in words and then shedding them dripping wet, hanging them out over the heat vents on the old laundry drying rack to see what you’ve got there. Like playing in the snow, writing is effort, and it is joy. It is quiet solitude like a lone brown bird on a branch, and it is frolic and snowballs against faces and windows, and it is community. Writing is scooping frosty mounds, tasting to see if it is the same as you remember. Writing is squealing at the new day’s beauty and knowing the freedom of this, and it is all kinds of glittery miracle when the sun hits flecks like diamonds. I know some of my midwest and east coast friends are so over the snow, but here in Portland we’re just getting our first taste, and it’s so good. Joining with Lisa-Jo Baker and the Five Minute Friday community with today’s writing, inspired by the view out my window and the prompt: WRITE. Come join us? What a tingling bit of writing!! Love love loved it! VIsiting from FMF. Love the imagery you’ve chosen. You have surely painted with words! Makes me appreciate the snow, which is saying a lot as I am in Michigan and have experienced more than is pleasant lately! I am thankful you are basking in it today! I view snow appreciation as a mini miracle, coming from a Michigander (is that how you say it?). Thank you for your kind comment. Spring is on its way! Oh, Ashley! I so get this. And I love the phrase about writing making paths through the drifts. Like Niki, I guess you know I’m in Michigan, and we’ve got more snow and cold than I remember in years–and years and years. But this little piece has warmed me more than a cup of hot cocoa. Sandra, I’m always amazed at how I just see piles, and then I start writing, and hey, there’s a path…it gets me every time. I never can anticipate where those little trails will go. So glad this warmed you up a bit. I bet you’re looking forward to seeing the little living things make their way through the soil. Sending much love. 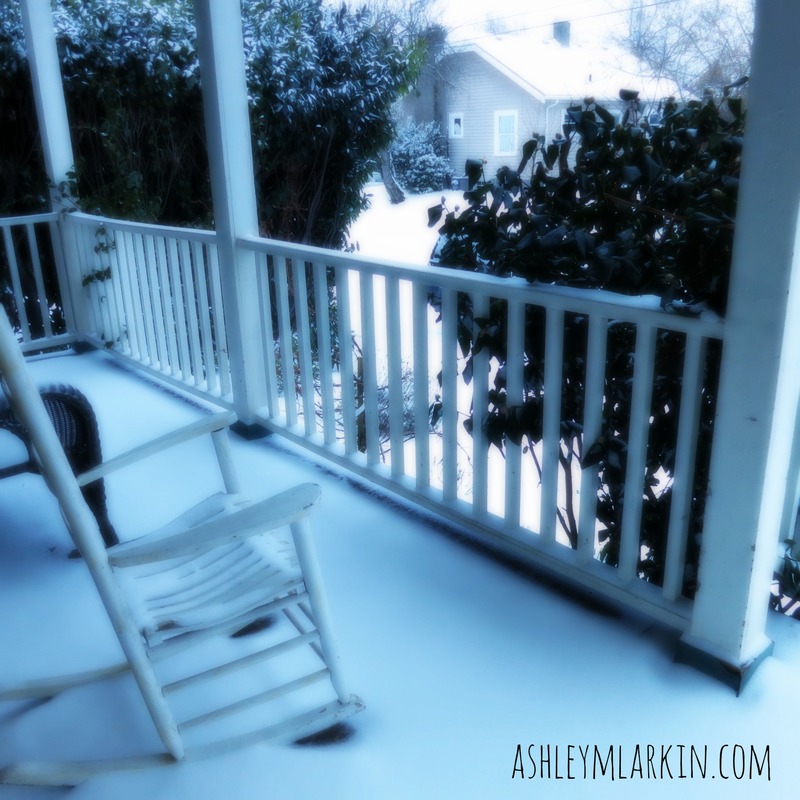 I’m curling up with your words, dear Ashley…they warm and soothe me (and make me want to write and roll in the snow). Isn’t all of this white magical? We have at least 10 inches here in Corvallis! Thank you for this bowl of comfort. Love you & can’t wait for our date next week. Magical is such the word, Julia. How the snow makes everything fresh and NEW. Yes, you all got hammered with it in Corvallis! I hope you had such fun. And I cannot wait to see you. xoxo! Sheer Beauty.. breathtaking, stunning beauty! I was just standing with my door wide open last night, listening to the snow fall like tiny bits of ice, and inhaling deep the crisp scent of Snow! Karrilee, I love you! And I love picturing you savoring that snow and its very scent. The way you appreciate life is just beautiful. I have to agree with you that writing can be a holy abandon at times, but also a holy sorrow where we can empty our hearts on paper and know our burden is shared by all those who read your words. Abandon and sorrow, both. Yes, Mia, I so agree. And that sharing of burdens is such a blessing. Thank you for your presence here. The snow is certainly romantic when it’s so occasional (here). You in upstate NY are living an entirely different sort of experience. I do hope you are able to find some not-taking-yourself-too-seriously moments with your little people today in the midst of the continual cold and snow. And yes, friend, spring is coming! I love the line about how writing says it’s worth it to remember the details. You might like Cara Strickland’s new series on her blog Little Did She Know (http://www.littledidsheknow.net). It’s called (de)tales, and she has a guest writer each Wednesday share a piece of writing based on the small details of an event. Thanks so much for letting me know about that series, Kim. I do love details, so that sounds right up my alley! Your words are as cozy as a cup of hot tea on a cold day. This is also what I love about writing remembering the details. Life passes too quickly and I want to savor the moments of life. Writing helps me do this. Thank you for sharing your heart with us today. You’ve said it so well, Jolene. Writing forces us to slow and savor. It’s good for the soul, isn’t it? Thank you for your words here today. How you do this thing called writing, bring it to life in images that wrap around my soul, continues to amaze me. I thank God for the day you chose to step out with your writing and begin this courageous trek of sharing it with us. I love your joyful heart in this post and I’m happy you’re all enjoying your beautiful snow day! Amber, you bless me continually with your love and presence, friend. xoxo! Your imagery is beautiful and so is your snow!!!! Thanks, Sis. Isn’t it purty?! I love whooping and hollering with you, Kelly! Glad you write! What a fun, delicious metaphor!! So true it is. Holy Abandon. I need to spend some time thinking about just that phrase alone! Very good. Thinking of you, my friend. Anna, so sweet to “see” you here. Sure have missed your beautiful face. I need to spend some time soaking up holy abandon myself. Thank you for always being a soft place for me to land. What a tremendous compliment, my friend. You telling me all those months ago that my words felt like home helped me see something deep that God was doing in me. So grateful for that and for you — continually a soft place for me, too.